We certainly understand the concern someone might have about more people reading Dolores' narrative on Dolores-Maxwell.com, and that someone might feel compelled to remove the note that was placed there by a reader of this site. Not only was the note taken, but everything placed by those who love Dolores, to mark the one-year anniversary of her death, were also removed. These were items from at least three different people.This happened very quickly after the “thank you” was published on this site. The objects placed in memory of Dolores will no doubt be replaced. 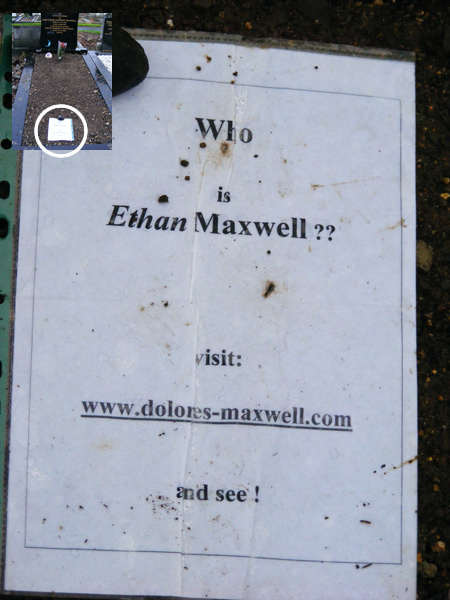 As far as that note, the members of Dolores-Maxwell.com have never publicised this site, believing that those who are concerned about the issues we raise here will find it. Nor does it seem that we need to promote it. Our webmaster informs us that this site is read by people from every continent, with the exception of Antartica. Most of the site's regular readers are from Ireland, the UK, Spain, Canada, and the US. Not only were we touched that someone placed that note on Dolores' grave, on reflection we think it a very good idea, and very much akin to this website being discovered by word of mouth. Therefore, in our future visits to Dolores' grave, the members of Dolores-Maxwell.com will follow in the steps of the person or persons who first put that note there, and will place a similiar one; by the time this is published it may already be done. It occurs to us that others might like to do the same, so we place the following images in the Public Domain and give everyone permission to use, copy, or alter them for whatever purpose they deem fit, with no restrictions whatsoever. Clicking on the image will open it full size.